To confer the 5th Hemis Winter Festival, His Holiness Gyalwang Drukpa Rinpoche reaches Leh on December 12. A warm reception was given by the people of Ladakh. His Holiness visited Chowkhang Vihara and was greeted by His Eminence Togdan Rinpoche, dPalga Rinpoche and Khamtak Rinpoche along with religious and political leaders. He stressed on restraining from consumption of non-vegetarian food which he said is not only against Buddhism but also causes imbalances in nature. 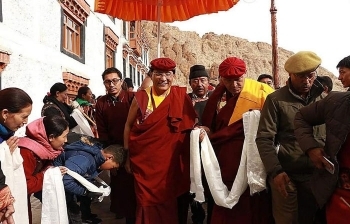 Talking about the importance of environment, His Holiness appealed people to avoid polythene bags and polythene packed stuff, during the offerings for ‘Deachen Jingdup’ at Hemis Winter Festival. The Hemis Winter Festival started from December 12 and will end on December 20.